This post is part of the “From the Bench” series celebrating the work of conservators. Part scientist, part detective, they work to preserve the past for the future. This series features the voices of conservators who are working on IMLS-supported projects in museums across the United States. For more information about IMLS funding for museums see www.imls.gov/applicants/available_grants.aspx. One of the pleasures and challenges of working at a small museum is dealing with the care of objects which fall outside the area of expertise of the staff. Such is the case with the Frick’s small collection of carpets. 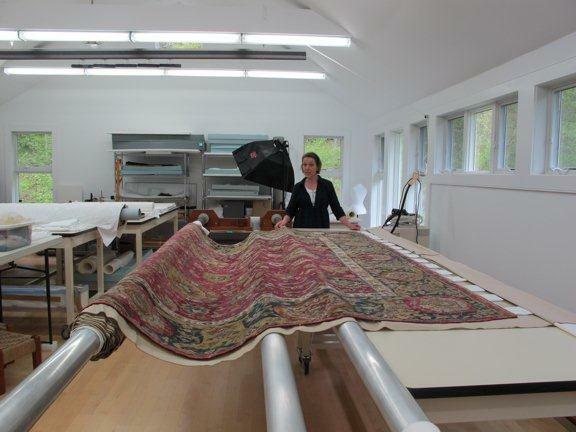 The Frick’s conservation staff includes experts in sculpture and decorative arts, but no one specializing in textiles. A sixteenth-century Herat carpet has decorated the Frick’s beloved Living Hall for almost 100 years. The carpet, purchased by Henry Clay Frick in 1916, is a superb example of Persian carpet making, with a wide range of pile color and a high degree of artistry in its elaborate floral design. At more than 400 years old, however, it had suffered several early campaigns of poor restoration and, though displayed behind stanchions, the edges had been further damaged by visitor foot traffic. It was clear to us that the carpet needed to be restored. Lacking the appropriate person on staff, the Frick turned to Dierdre Windsor of Windsor Conservation, a long-time colleague of the Frick’s chief conservator. Ms. Windsor has many years of experience in textile conservation, including seven years as director of the American Textile History Museum’s Textile Conservation Center. We also sought the advice of Walter Denny, professor of Art History and adjunct professor of Middle Eastern Studies at the University of Massachusetts, Amherst. Mr. Denny is a leading expert in the field of Islamic art and was an adviser to the Metropolitan Museum of Art on the re-installation of its Islamic galleries. The project’s goal was to stabilize the carpet. The level of previous intervention made this a large task requiring the removal of many patches and resins, hundreds of pieces of backing fabric, old repairs, and embroidered repairs with bad color matches or misalignment. Ms. Windsor estimated it would take eighteen months to complete the work required. The treatment process began with careful documentation of the entire carpet’s specific condition issues. The carpet was then vacuumed and solvent-cleaned. Following the cleaning, old repairs were addressed. For future display and storage, a new dustcover and lining were fabricated and an archival carpet pad made for use when the textile is on display. There were some minor changes to the original plan. For example, due to the extremely complex restoration history of the carpet, which was discovered only when the lining backing the carpet’s border was removed, the condition assessment and documentation of the carpet took longer than originally planned. While it was tempting to remove all of the early repairs, we decided to take a conservative approach rather than risk causing further damage. Removal of many of the visually distracting older repairs resulted in a much more visually consistent appearance. Following the eighteen-month treatment, the carpet is now in a much more stable condition and can be safely put on view where viewers can appreciate the carpet’s remarkably vibrant original colors.